Co-Optimus - News - Rumor Explosion! Call of Duty: Black Ops 2 Reveal Date Leaked? Whilst the likes of Microsoft may not comment on rumour and speculation, we at Co-Optimus sure do. In fact, if it were possible I would liquidize all gaming rumors and shower in their gossipy goodness every morning. With that imagine stained upon your cerebral cortex let me hit you with the latest mega rumor. 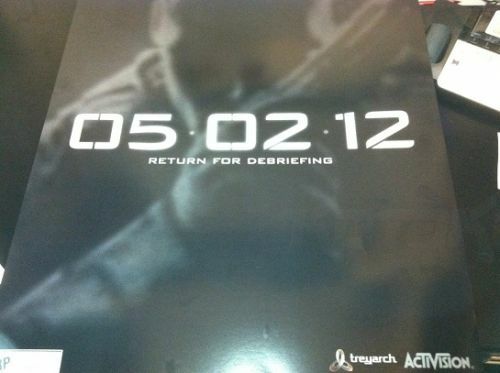 According to a leaked image provided via Kotaku, Call of Duty: Black Ops will be revealed May 2nd - juicy! As with all forms of speculation, this image should be taken with a pinch of salt. However, the pic was reportedly leaked from a retailer who is off to see a Beta version of the game in May. A follow up to CoD: Blops would make sense giving the Modern Warfare strain a break and also adding momentum to the Cold War based series. There is absolutely no news about what the game will entail, but some form of co-op has been present in the previous versions of Call of Duty, be it Spec Ops, Zombies or even Campaign back in the day. Here's hoping that all three areas are covered this time round for one massive co-op smorgasbord. I'm off now to bathe in luxurious rumor water provided by news about God of War 4 MMmmmm.